Collecting and decorating with authentic nautical antiques and furnishings, original marine art and handcrafted nautical accessories, ship's salvage and other nautical paraphernalia, re-purposed for the traditional coastal home and featuring the finest of nautical-coastal living. 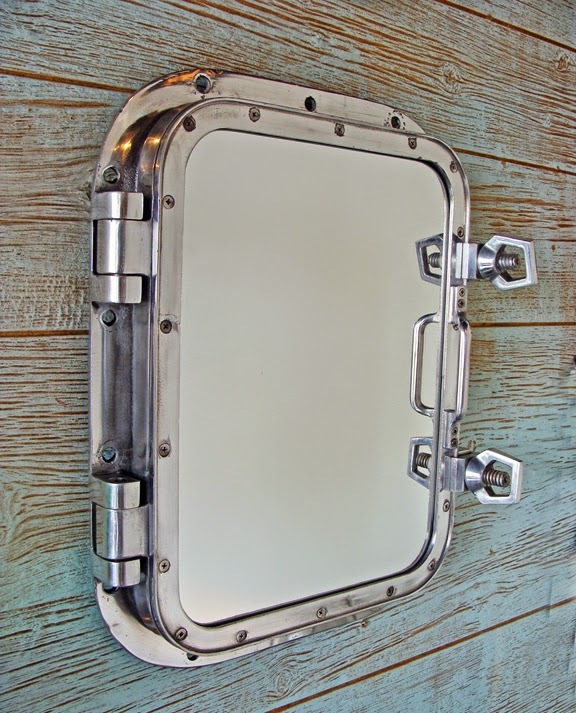 Recently, I was hunting around on Pinterest (nautical furnishings and furniture) and came across an image of an aluminum ship's window re-purposed into a nautical mirror. This picture was linked to a blog written by Courtney Price titled "The Hampton Designer Show-house" where top interior designers turn a New England home into a, as the author describes it, "decorating masterpiece." The house located in Bridgehampton, New York was certainly dressed up in top fashion. Authentic ship fixtures re-purposed and used to create this beautiful nautical bathroom. By New York design company Melanie Roy Design. 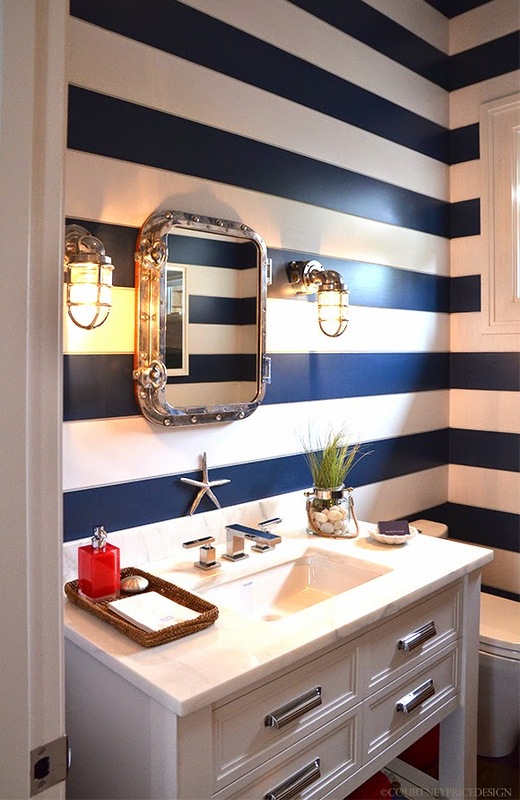 Part of the first floor (bath and mudroom) was designed by New York designer Melanie Roy of Melanie Roy Design selecting a strong blue and white striped wall covering and navy blue walls contrasting white painted wood trim and bathroom cabinet with polished steel drawer pulls and bath fixtures. 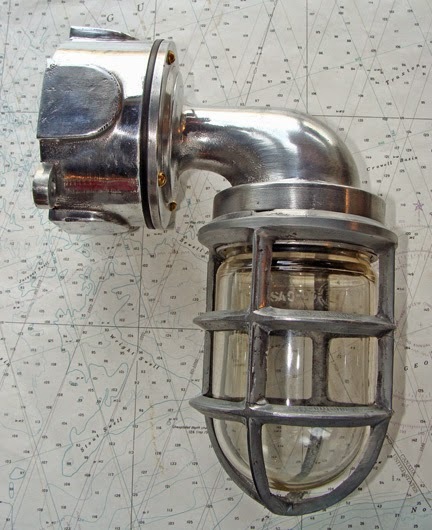 The mirror and lights above the bathroom sink were re-purposed ship salvage items including a ship's window converted into a mirror (could also be the front of a medicine cabinet) flanked on both sides with 90 degree aluminum caged passageway lights. (see below). 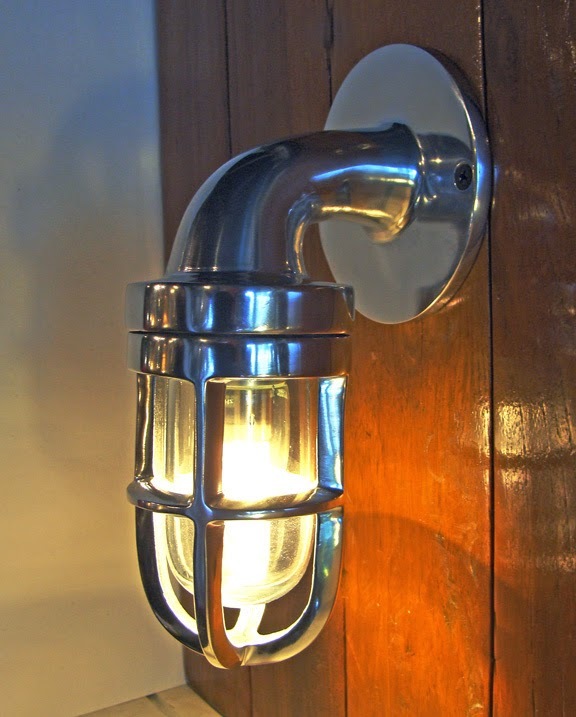 This is a beautiful example of utilizing authentic, high quality nautical fixtures, re-purposed and used once again as part of creating a very attractive nautical inspired bathroom. Kudos to designer Melanie Roy! Another appropriate choice would have been one of our authentic large opening ship's aluminum porthole with 2 dogs recycled from the shipping industry that we've re-purposed into an impressive nautical mirror. These portholes are made from aluminum and to the highest marine specifications, salvaged from British and European ships built in the 1970's/ 80's. 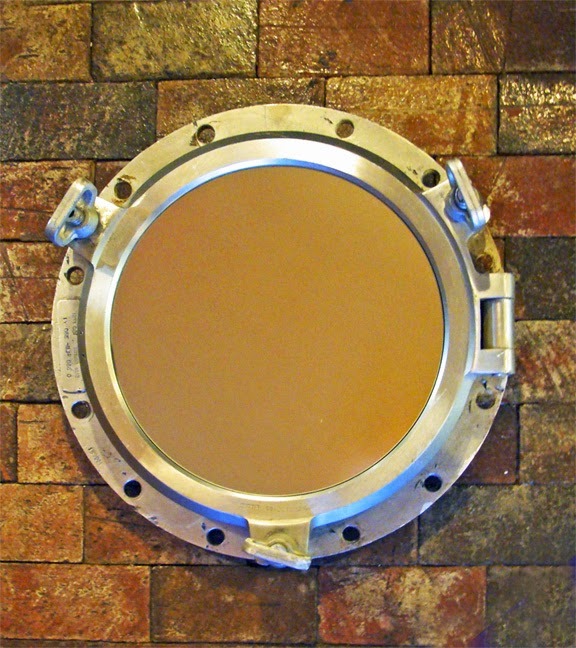 Aluminum portholes are much lighter than their brass and bronze predecessors which makes them usable as a wall hanging in any nautical/coastal interior. The overall diameter of the porthole measures 19 1/2 inches and the mirror measures 13 3/4 inches. The weight is approximately 18 pounds. Skipjack Nautical Wares & Marine Art Gallery is a major supplier of authentic nautical lighting, ship salvage, custom furniture and furnishings, decor and marine art to the interior design trade. Visit our web store at Skipjack Nautical Wares & Marine Art Gallery or stop by our riverfront showroom located in historic Olde Towne Portsmouth, Virginia. Great Chesapeake Bay Schooner Race. There are schooners here, there and just about everywhere participating in the Great Chesapeake Bay Schooner Race (GCBSR). The 25th annual race begins Thursday, October 16th on the south side of the Chesapeake Bay Bridge near Annapolis, Maryland. The schooners race throughout the afternoon and night into the next day to their designated finish line. For classes A and AA, the finish is an east-west line at Thimble Shoal Light and classes B and C finish at Windmill Point. Then they proceed on to docking in Portsmouth, Virginia along the quaint historic seaport's basins and seawall. of the Great Chesapeake Bay Schooner Race. Photo by Joe Elder. With 34 entries in this year's race represented from all around the Chesapeake Bay and as far away as Key West, Florida, they'll be schooners of all types and sizes for you to view. The schooners will be on view in Portsmouth's North and High Street Landings as well as along the Olde Towne riverfront. Some may be available at times for boarding and tours. Make sure to bring your camera along for this is surely a great photographic opportunity. Great Chesapeake Bay Schooner Race. Photo by Allen Graves. Plan to spend the day and take in all that Olde Towne Portsmouth, Virginia has to offer. This is a great time to stroll along our historic High Street corridor and visit our exceptional antique shops, art galleries and unique specialty stores found in Olde Towne. Have a great lunch or dinner in one of our chef and family owned restaurants, sports bars and pubs...there's plenty to choose from and you'll definitely find one to your liking. 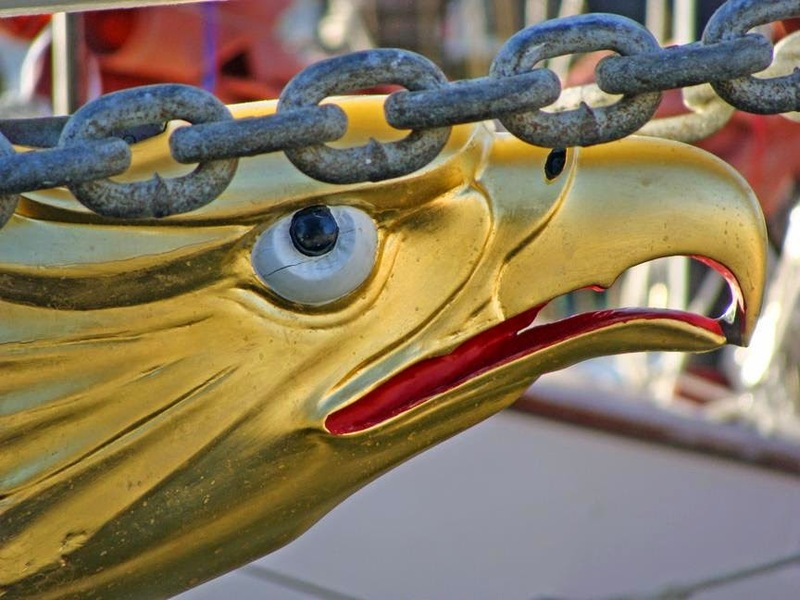 Figurehead of the Schooner "Lady Maryland." Photo by Joe Elder. Schooner racing on the Chesapeake Bay is rooted in the trade rivalry between Baltimore, Maryland, at the northern end of the Bay, and Portsmouth/Norfolk, Virginia, at the southern end. The fastest sailing vessels delivered goods and people to their destinations and often garnered the best price for their cargo by beating slower schooners into port. Over the years, commercial schooner designs evolved for the bay's routes — taking into consideration shallow waters, local crops and regional needs, with speed being a primary concern to beat competitively loaded vessels into port. These schooners also played a critical role in our nation's early wars. 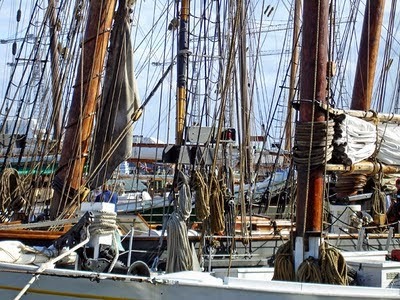 While there are no cargo-hauling schooners now working the Bay, there are a considerable number of schooners still in use as cruising vessels and privately owned boats. Olde Towne Portsmouth, Virginia. Photo by Joe Elder. 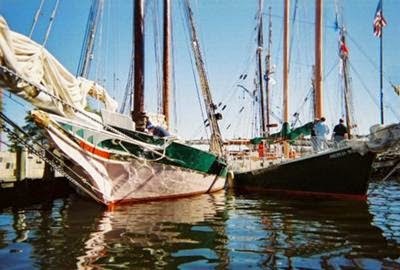 In 1988, when the City of Baltimore launched her flagship modeled on those earlier vessels, Captain Lane Briggs of the Tugantine Norfolk Rebel — the world's only sail-powered schooner-rigged tugboat — challenged the Pride of Baltimore II to a race from Baltimore to Norfolk, reviving an historic rivalry between schooners, captains and cities on the Bay. 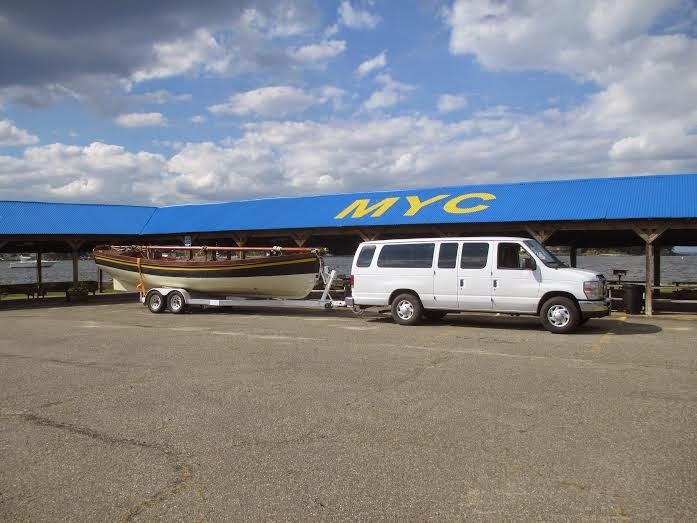 With the challenge accepted, the Great Chesapeake Bay Schooner Race (GCBSR) was born. "Mystic Whaler" sails into Baltimore before the race begins. Photo by Joe Elder. Over the 25 years of the Great Chesapeake Bay Schooner Race, there have been some incredible races with schooners going to the wire to win. Harsh weather conditions in some of the races have tested the mettle of the vessels, crews and captains. As many as 56 schooners have signed up for a single race, and more than 150 — with vessels from as far away as California - have enjoyed the fall race on the Bay. The 2007 race was the fastest race in this long series. With strong following winds, several schooners set new records for both elapsed and corrected time. The schooner Virginia set a new time to beat of 11 hours, 18 minutes and 53 seconds, beating the previous record of 12 hours, 57 minutes and 51 seconds set by Imagine...! in the 2005 GCBSR. It’s a folksy collection of whales, mermaids, fish, fowl, carvings, paintings, models, trade signs, weathervanes, folk and sailor art representing some of the finest American folk artists working today combined with with examples made in the past. Some are whimsical, others memorable, but they are all simply delightful! 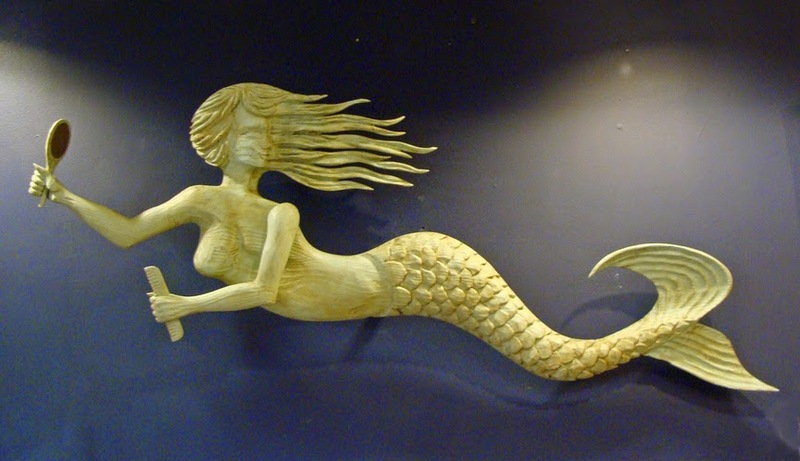 Swimming mermaid wood carving by Virginia artist Jac & Patricia Johnson. Welcome to Skipjack's Annual American Marine Folk and Sailor Art Show! This year once again features a select blend of marine marine art from some of the best marine folk artists working today together with a selection of vintage and antique examples. This year, we have the privilege of introducing New England folk carver John Shaw to our show. His carvings represent a traditional rustic folk art style similar in composition to carvings created during the early days of whaling. Each whale is hand-carved and painted in a style that replicates an antique example. John's carvings are created using native white pine and finished in acrylic paint and sealed both front and back with spar varnish urethane for durability. John Shaw is a native of Plymouth, Massachusetts and a direct descendant of the pilgrims. He has been carving and painting for over 30 years with a focus on wildlife. Custom carvings may be commissioned. We are pleased to have this fine marine artist as a part of the Skipjack family. Here is a link to the American Marine Folk and Sailor Art Show now on display at Skipjack Nautical Wares & Marine Gallery in historic Olde Towne Portsmouth, Virginia. The show runs through November 8, 2014. The gallery is open Monday- Saturday 10 am to 5 pm and Sundays from 1 pm to 4 pm. You can also visit our web-store 24/7 by following the link here: Skipjacknauticalwares.com. Often, my art efforts have a direct link to my historical re-enacting. A recent case in point was in Baltimore, participating in the Star Spangled Banner celebrations. 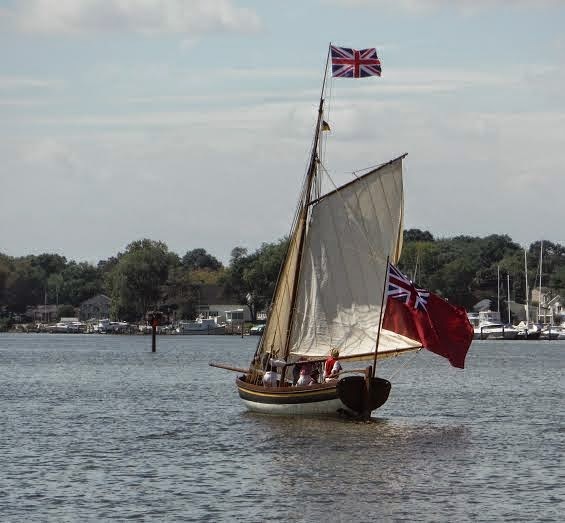 I towed my 27-foot longboat up from Texas, met with a Canadian crew, and some Maryland-based Royal Marines, and joined in the 1814 festivities. Driving to Baltimore, Md. from Texas with longboat in tow. The Maryland Yacht Club hosted us for the week, and we obliged by performing a wartime British boat landing at the Club. We exchanged cannon shots, then I had fun with the crowd attending as an arrogant British naval officer, “… in time, you impulsive colonials will learn humility and your proper place in the world…”, and afterwards enjoyed a buffet dinner and chat with all combatants under a temporary truce. The MYC gave me a gift club burgee pennant, and I surrendered my masthead Union Jack as a trophy of the affair. the Star Spangled banner celebration. 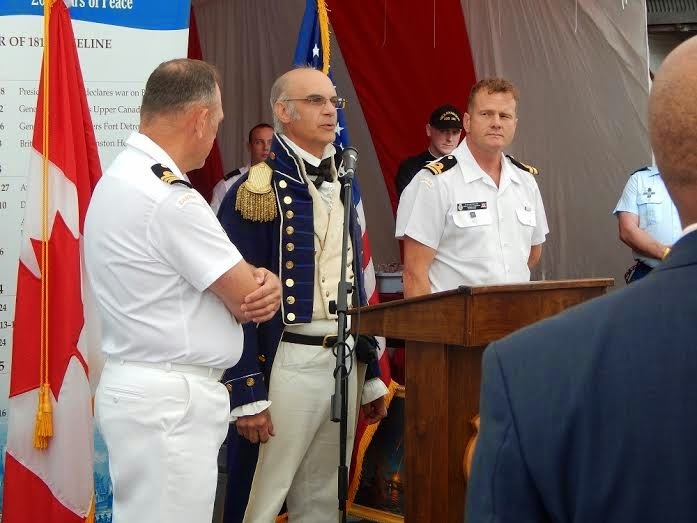 On Saturday, we went aboard a visiting Canadian Navy frigate in Baltimore Harbor for a cocktail reception – appropriate because the British campaign of harassment on the Chesapeake was largely to take the pressure off British troops on the Canadian border. The company and food were excellent. We later witnessed the tremendous fireworks show, then returned again on the Sunday morning to see the large 1814 flag raised over Fort McHenry– which we answered with our own Star Spangled flag and gun salutes. The tie-in with my art is that I had learned in my research that longboats like mine had been sent in close to the Fort on that fateful night, to launch a diversionary cannon and rocket attack on the American batteries. I painted a six-foot oil on canvas of that scene, from the point of view of the British boats milling about in the dark, as the Fort was pounded by the British ships. It was a tense moment in American history because Washington had fallen, and the defenders under heavy bombardment also expected a land attack at any moment. "Perilous Night." A painting by marine artist Peter Rindlisbacher. Skipjack Nautical Wares & Marine Gallery was able to supply me with framed giclee prints of the painting to give as gifts to the yacht club and Canadian warship. All in all, it was a truly satisfying trip, and suitable wrap up to the 200th Anniversary commemorations. 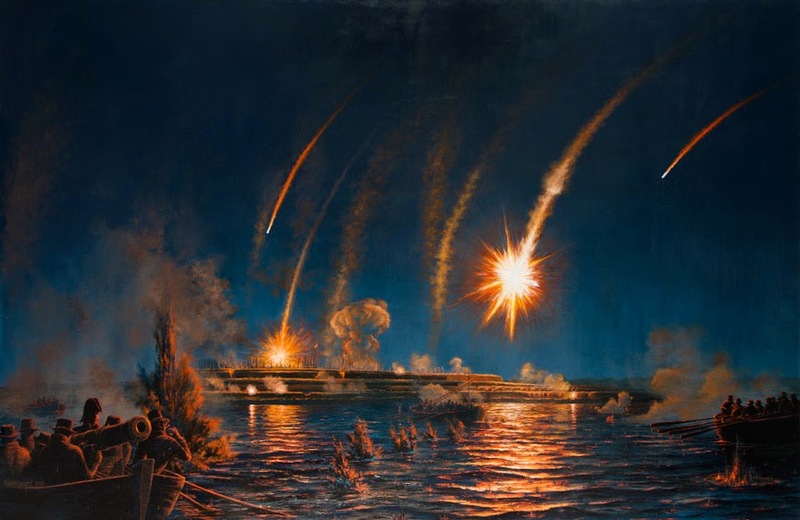 Perilous Night; Naval Attack on Fort McHenry- Original Painting by Peter Rindlisbacher. The painting portrays the scene in the Ferry Branch of the Patapsco River off Fort McHenry about 1:;30 AM, September 14th, 1814. Nine armed barges full of picked men from the Royal Navy were discovered in the midst of their diversion attack, while Fort McHenry was being shelled with bombs and rockets from a line of British warships. The crossfire from the three U.S. forts and land batteries, and lack of progress in the British land attack, made the boats to withdraw out of range after a few hours of exchanging fire. Fort McHenry survived the night, of course, and a view of the flag still there by morning inspired the National Anthem. Instead, the artist opted for what one historian has called "the first from this view", a little known element of the Battle, that a flotilla of armed British boats had been sent in close to the Fort as a diversion for the main land attack. Rindlisbacher's depiction is in among those boats, which likely had the best view of the Fort and battle that night. The boat assault coincided with one of the most dramatic and dangerous times in the Nation`s history. The Treasury was virtually bankrupt, weeks before Washington had been captured easily, the Whitehouse had been burnt, the First Family barely escaping, and Baltimore was expected to fall next. Portraying the high drama of that night was the artist’s objective in this painting, and its terror and violence cannot be overstated. Bombs, rockets and cannon balls relentlessly rained down on the Fort from the attacking ships and boats, while the Town waited in fear -- hours all in the midst of intermittent rain, thunder and lightning. Oil on canvas measuring 48 X 72 inches, unframed. This just completed painting by marine artist Peter Rindlisbacher portrays the scene in the Ferry Branch of the Patapsco River off Fort McHenry about 1:;30 AM, September 14th, 1814. Nine armed barges full of picked men from the Royal Navy were discovered in the midst of their diversion attack, while Fort McHenry was being shelled with bombs and rockets from a line of British warships. The crossfire from the three U.S. forts and land batteries, and lack of progress in the British land attack, made the boats to withdraw out of range after a few hours of exchanging fire. Fort McHenry survived the night, of course, and a view of the flag still there by morning inspired the National Anthem. The painting is now available for purchase and be seen at Skipjack Nautical Wares & Marine Gallery, One High Street, Portsmouth, Virginia. Giclee prints on stretched canvas are now available in two sizes: 24 inches X 36 inches and 40 inches X 60 inches. Here's the link to the artist's page at Skipjack Nautical Wares & Marine Gallery. Released May 2013. 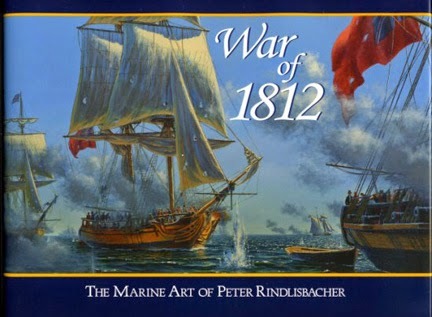 War of 1812 : The Marine Art of Peter Rindlisbacher showcases 120 paintings in color by Peter Rindlisbacher, CSMA, of the maritime events during this epic time. His artwork documents many of the ships which were involved in the Great Lakes arena along with sailors and militia. This 190 page book is a record of his superb work with an introduction by Donald E. Graves and forward by Victor Suthren. Published by Quarry Press, Kingston; ISBN 978-155082-364-6. *Museums and historic sites in the U.S. and Canada have purchased many of his paintings and his artwork is represented in part here at Skipjack Nautical Wares & Marine Gallery. Art in a Bottle- How Did They Get That Ship in There! 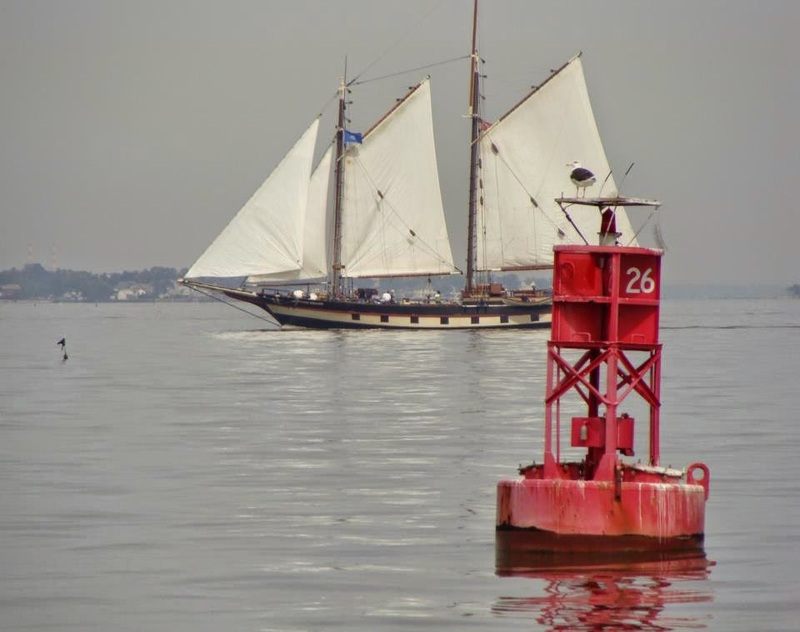 The Schooner Virginia Races the Pride of Baltimore II past Thimble Shoals Lighthouse. Created by marine artist Heather Gabrielle Rogers. 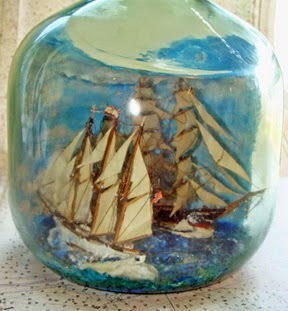 The first known ship inside a bottle was created during the early years of the 19th century. Like other sailor-made art forms, these were created aboard old sailing ships in an era when sea voyages lasted months and sometimes years. Whalemen, during their idle hours, produced scrimshaw for family members, sweethearts, and friends. Decorative and utilitarian objects were carved from bone, ivory teeth, and baleen, and designs were engraved on the same materials. But other materials such as wood, rope and yarn were also used, and many interesting and decorative objects were created from these. 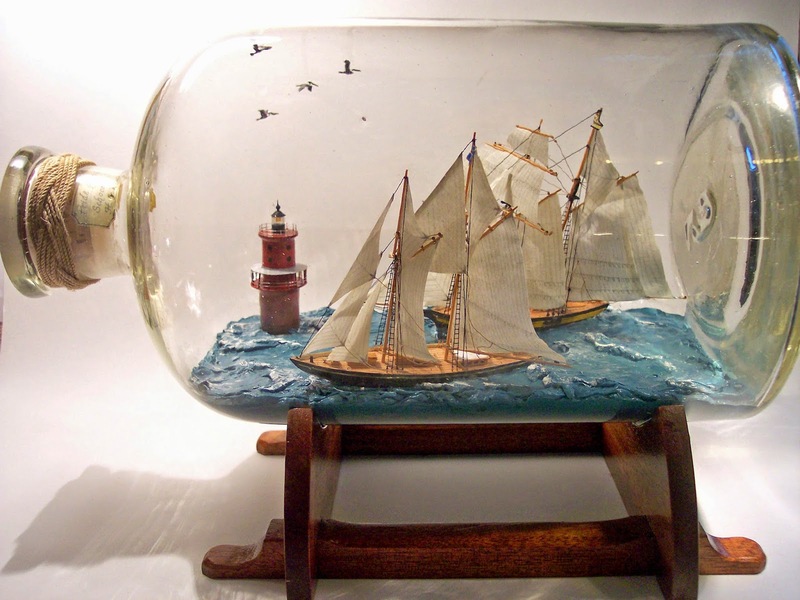 Two tall ships pass each other in this early 20th century ship in a bottle diorama. 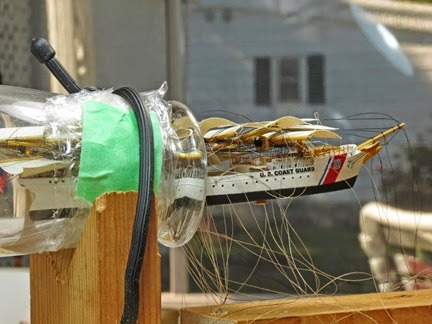 It is not surprising then that an empty spirit or a medicine bottle lying around aboard ship might have spurred the imagination of a 19th century seaman into devising a way to display a model ship in it. Whatever the origin, the technique for placing ships into bottles was passed along and over time became a favored art form for sailors. Some sailors produced a facsimile of the ship that they sailed aboard; others may have created multiple ships passing by under full sail on rough painted clay seas or a diorama of a ship in harbor with the seaport in a background, a lighthouse at the harbor’s edge, possibly with tugboats in tow. These works can now be found in maritime museums around the world for there are few sailor-made decorations as nautical as a bottled ship. Tom Applegate prepares the US Coast Guard tall ship "Eagle" for launching in the bottle. Today, ship-in-bottle artists have taken the old sailor art form and produce exceptional works of art with microscopic detailing that will rival anyone’s imagination of “how did they get that in the bottle.” A selection of new works by Heather Gabrielle Rogers and Tom Applegate will also be a focus of this nautical show. 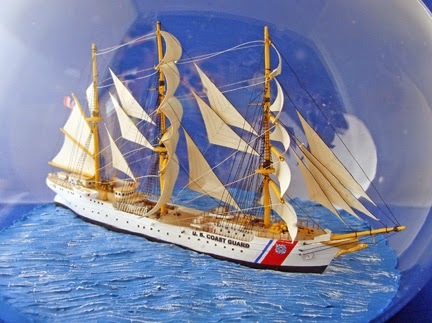 The US Coast Guard tall ship "Eagle" under sail on blue clay seas. artists Heather Gabrielle Rogers and Tom Applegate. Heather Gabrielle Rogers- As a passionate crafter of ships in bottles, Heather has developed a huge appreciation for the challenge of constructing these tiny ships with my main focus directed towards detail. Her overall goal is to always produce what appears to be a miniature version of a ship or vessel captured in a moment in time. Thomas Applegate- From as far back as he could remember he has had a love for the sea. In the early 1970's he made his first ship in a bottle, a brigantine. Being self taught, he found it very challenging and rewarding. Over the years, he has researched each vessel he has created in order to make them a work of art while being true to life. Skipjack nautical Wares & Marine Gallery is located on the riverfront, 1 High Street next to the High Street Landing in Olde Towne Portsmouth, Virginia. Parking is available in the municiple parking lot next to the gallery and the Water Street garage located across the street of the building and along High Street. "Art in a Bottle" will be an ongoing show through September 28, 2014. The gallery hours are Monday through Saturday 10 am to 5 pm and Sunday from 1 pm to 4 pm. Special showings can be arranged for groups by calling the gallery. You can visit the gallery or peruse the collection online on their website at:www.skipjacknauticalwares.com. You can call the gallery at (757) 399-5012 or email at [email protected] The gallery showing is free to the public. The artwork is available for purchase but cannot be removed until the show is concluded. 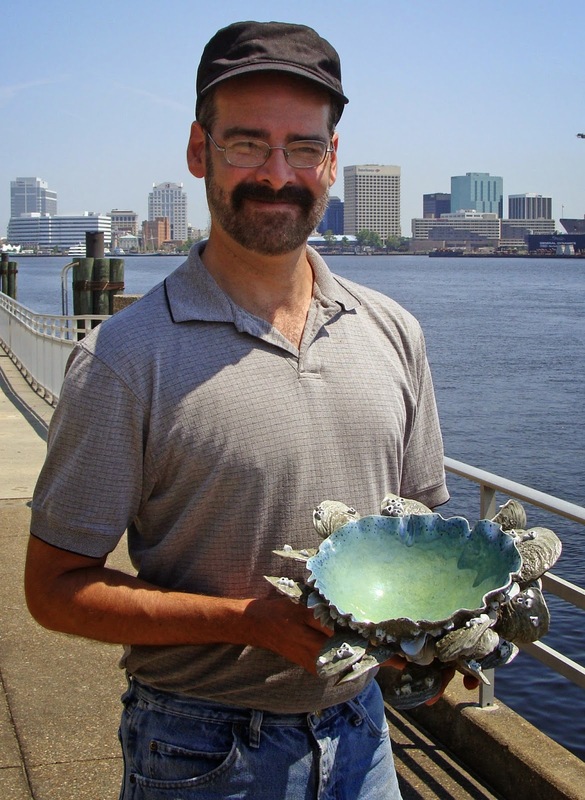 Kevin Collins holds one of his sea bowls. Inspired by marine life that survive in the brackish habitats that exist along our Virginia shore, kevin Collins brings to life a unique collection of ceramic (porcelain) creations for your coastal home. The forms take on shapes of modeled bowls with oyster shells and barnicles and shell colored inner surfaces in shades of pink, coral, blues, greens and purples. Kevin's earthenware creations also take on the form of shell lamps, some actually starting with a piece of driftwood with small sea creatures added to the natural surface. His collection also includes shell-designed necklaces and earrings and even individual oyster shell and clumps of barnacles as refrigerator magnets. His designs are endless and we never know what Kevin will come up with next. These porcelain art pieces are functional art oieces and perfect decor item for your beach and coastal home. 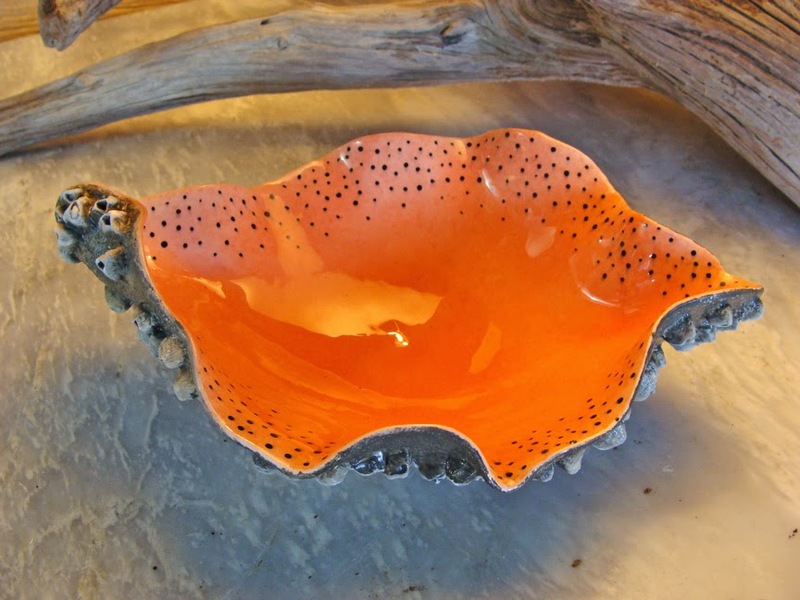 Sea-inspired coral colored ceramic bowl with barnacles. Kevin's first experience in creating pottery was at the age of 12. He was offered a class in ceramics and discovered that he inspired to working and creating art with his hands. He also was interested in oceanography at a young age and fascinated with ocean marine life and the small sea creatures that lived along the waters edge and could be observed during the change of tides. Low tide exposed a variety of mullosks such as barnacles, oyster shells and welks and crustaceans that survived in our local waters with each ebb and flow and attached themselves to it's coastal surroundings. Kevin selects colors for his creations reminescent of the smooth interior of shells like conchs, oysters and giant clams. 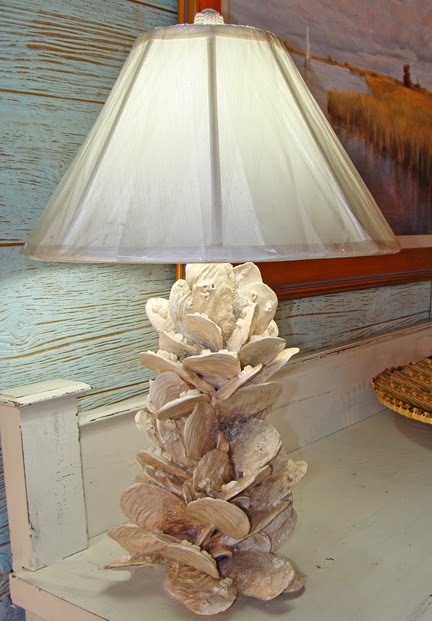 Oyster shell lamp by Kevin Collins. You can visit and see Kevin's coastal creations in person at Skipjack Nautical Wares & Marine Gallery located along Olde Towne Portsmouth Virginia's riverfront (next to the High Street Ferry Landing and basin). Or on their webstore at Skipjack Nautical Wares & Marine Gallery or go directly to Kevin Collins page by following the link here; marine artist Kevin Collins. 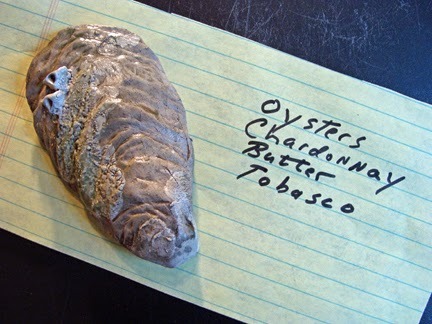 Ceramic oyster magnet vy Kevin Collins.